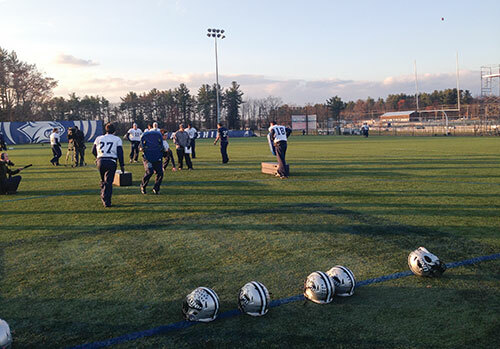 On a crisp fall afternoon, a dozen UNH football players in blue practice jerseys line up across from safeties coach Scott James, who steadies a rectangular blocking dummy with an outstretched hand. 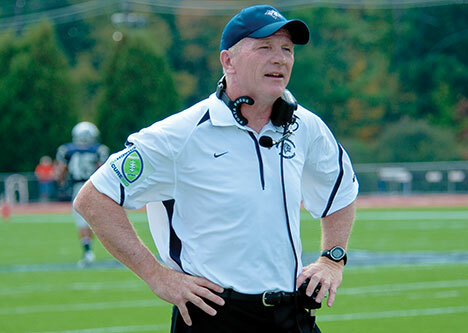 One by one, as head football coach Sean McDonnell ’78 barks commands — go, go go! Run through your feet! Keep that head out of it! — the players launch themselves at the dummies, wrapping their arms around the life-sized forms and pulling them to the ground. As each player takes his turn, he executes a balletic roll or two before he releases the dummy, then pops to his feet and trots to the back of the line to do it again. It’s an unremarkable drill, save for one remarkable detail: not one of the players is wearing a helmet. 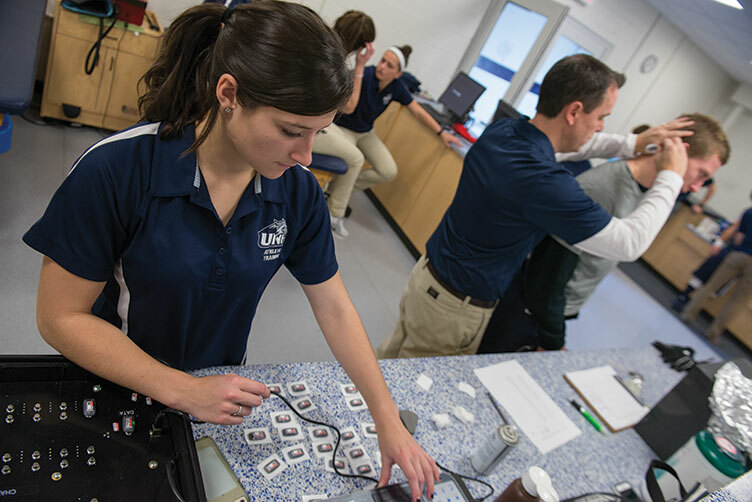 For the two most recent seasons, while UNH’s Wildcats were racking up wins and extending their appearance in the playoffs to a Football Championship Subdivision (FCS)-best 12-straight seasons, they were also participating in some novel research under the direction of kinesiology professor Erik Swartz. 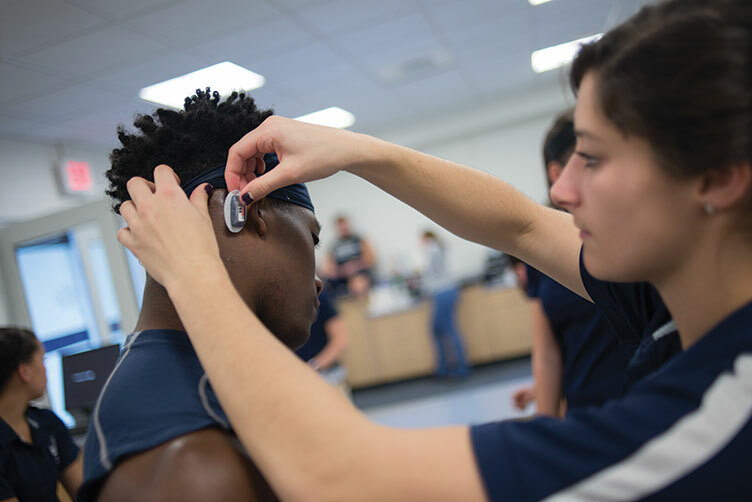 Twice a week, 50 of the team’s 90-odd players would report to the athletic training room prior to practice to have a head-impact sensor, a patch roughly the size and shape of a Band-Aid, taped in place just behind their right ears. At a predetermined point during practice — a two-plus hour stretch of strength, agility and cardiac conditioning drills that unfold with military precision and intensity — they would peel off from the rest of the squad for a five-minute series of exercises that involved tackling into an upright pad or a teammate holding a padded shield. Half of the players would remove their helmets and shoulder pads for these exercises; half of them would keep them on. At the end of practice, those 50 players would return to the athletic training room to have their sensors removed and the data they contained — the frequency, location, linear and rotational acceleration and duration of every impact they had sustained over the course of the afternoon — recorded. “It’s called helmetless tackling training, or HUTT™,” says Swartz, the acronym a nod to the call quarterbacks make before the snap on every offensive play. “The concept is relatively simple. We wanted to see if removing the helmet would compel players to adjust their tackling technique in such a way that they would sustain fewer head impacts, not just during the drills, but also when they put the helmet back on.” With enough time and muscle memory, Swartz hoped, even just 10 minutes a week of helmetless practice would translate into a reduction in the incidence of concussions and other head and spine injuries. For the past decade or so, concerns about head trauma have loomed large over football in the United States, propelled by highly publicized stories like that of Junior Seau, a San Diego Chargers linebacker whose depression and suicide at the age of 43 were linked to chronic traumatic encephalopathy, or CTE, a type of brain trauma associated with repetitive impacts. While football is hardly the only sport in which there is a high risk of concussion-related brain injury (indeed, CTE was first known as dementia pugilistica — fighter’s dementia — for the way “punch-drunk” boxers would stagger through punishing rounds in the ring), football players can start experiencing head-jarring contact as early as age eight, and by the time they are playing at the college level may sustain more than 1,000 serious hits in a single season. “It made me a little nervous at first,” McDonnell admits. “The whole idea of sending my players into contact without helmets. How was that going to work?" From the Pop Warner level on up, the push has come to make football safer, from more rules and penalties around what constitutes safe play to quicker and more stringent concussion diagnosis protocols to ever-more high-tech equipment designed to absorb head impact. These measures are important, Swartz says, but he was struck that none directly addressed the fundamental issue: the behaviors that lead to head impacts. (In fact, he notes, “safer” equipment can actually contribute to the problem as players develop a false sense of security around the protection provided by their helmets.) To get at that root issue of player behavior, Swartz came up with an idea that was at once obvious and utterly counterintuitive: take away the helmets and see how players adapt their tackling style to compensate. He applied for and received one of seven $500,000 “Head Health Challenge II” research grants from the NFL, Under Armour and General Electric, and in spring 2014, he approached McDonnell about piloting HUTT™ with his team. McDonnell and safeties coach James worked with Swartz to marry the kinesiology professor’s concept with real-world football drills, and Swartz joined the team for the spring practice season to familiarize the players with the exercises. Because it was a two-year study, only players who would be sophomores or juniors for the fall 2014 season were eligible; 50 of those eligible players were randomly assigned to either the study (helmetless) or control (helmeted) group, assignments they would keep for the duration of the study. All 50 players wore the impact-recording sensors for every practice and game. The results were unequivocal. By the end of the 2014 football season, Swartz observed a decrease in head impacts of almost 30 percent among the cohort of players who participated in the helmetless drills — not just in practices, but in competitive play. At the same time, those players’ performance on the field remained the same or improved, even as the squad earned its first-ever FCS first place ranking and advanced for the second straight year to the semi-finals of the division championship. 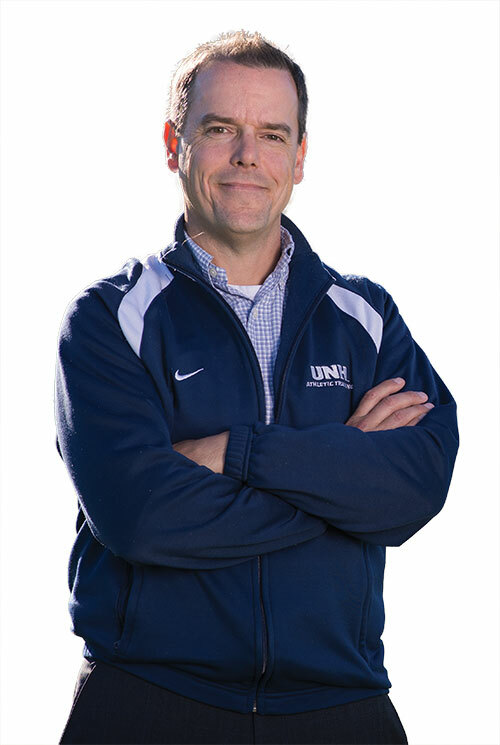 "Simple fact” or no, the study itself is a significant departure from the academic questions that have defined Swartz’s UNH career to this point; he’s spent the majority of his 15-plus years in New Hampshire Hall looking at equipment safety. He’s published multiple studies exploring safe ways to remove helmets and pads from athletes with cervical spine or head injuries and presented the NFL with a prototype for quick-release shoulder pads for injured players. As a member of the NFL’s Head, Neck and Spine Safety Equipment and Rules Subcommittee, his research was central to the league’s 2014 ban on the use of overbuilt facemasks. But the HUTT™ study is also a natural extension of one of Swartz’s personal interests: rugby, a sport he began playing in graduate school in Ohio and continued after coming to UNH with the Seacoast Rugby League. "This is the first study out there to really focus on changing behavior to mitigate risk rather than finding ways to accommodate it." With his year-one results now out in the world, Swartz is not the only one asking that question. 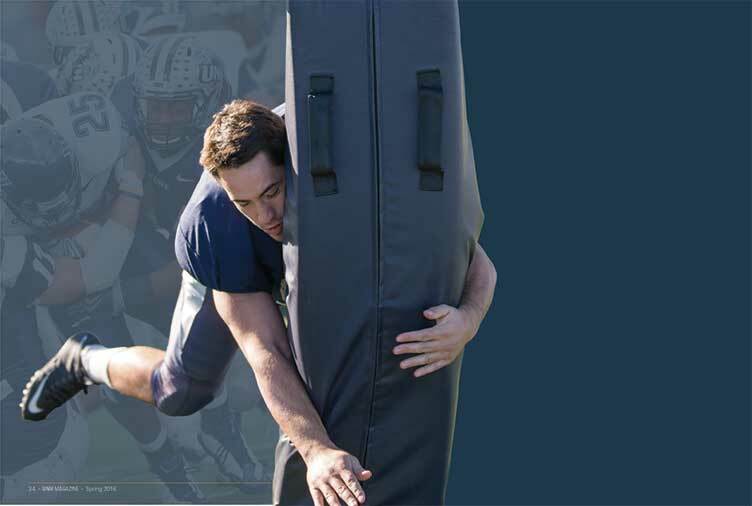 Given the magnitude of the issue and the strong positive correlation between HUTT™ and head safety, it might seem like an obvious next step to push for the broadest implementation possible, from Pop Warner right through the pros. But Swartz and McDonnell say it’s critical to proceed with caution. For one thing, players have to be skilled at a certain level to execute helmetless drills safely (“The last thing you want,” says McDonnell, “is to have your players out for a couple games because they cracked heads or someone wound up with a broken nose because he didn’t have the body control to do the drills the right way”); for another, coaches have to understand how to teach them correctly. Swartz is developing a written manual and video for HUTT™, which he used last fall with four New Hampshire high school football programs participating in the research: Bedford, Exeter, Dover and Pinkerton Academy. Swartz and McDonnell teamed up to run a one-day clinic on campus for the participating programs; some of McDonnell’s players demonstrated the drills. “It would be irresponsible to roll this out at the youth level without studying it first,” Swartz says. “There are some real physical and cognitive developmental issues that need to be taken into consideration before you ask younger players to go into contact without protection.” Even at the high school level, Swartz notes, the players are spending 10 minutes on the drills McDonnell’s players covered in five. Assuming favorable outcomes from the high school study, Swartz envisions a broader New Hampshire rollout for HUTT™, and a commercial version of the program as early as the end of this year. Back on campus, McDonnell says he will continue to run the HUTT™ drills with his players, even though the study came to its effective conclusion with the Wildcats’ FCS playoff first-round loss at home at the end of November. The end, yes, but perhaps also the start of a minor revolution that will help make one of America’s best-loved pastimes significantly safer.